This defect, involving the thickening of the heart's muscular tissue, most often in the ventricular septum, often goes undiagnosed until late childhood or adulthood and is responsible for 35% of all sudden deaths among the young. There may be no symptoms prior to sudden death. However, some patients experience breathlessness during exercise (dyspnea), fainting (syncope), heart palpitations, and/or heart failure. It is a feature of this defect that it manifests in a variety of ways. Hypertrophic Cardiomyopathy (HCM) may be readily diagnosed through a variety of tests, including electrocardiography (producing an ECG, or electrocardiogram) and echocardiography (producing an echocardiogram). The ECG will show abnormalities in 80-90% of HCM patients. About 25% of patients will develop arrhythmias (e.g. ventricular tachycardia, atrial fibrillation). A heart murmur may be present, characterized by changes in its nature depending on the position of the patient. Typically, the murmur will decrease in intensity as the patient goes from a standing to a squatting posture, and vice versa. The treatment of patients with HCM depends on the nature of the defect. If the enlarged ventricular septum results in left ventricular outflow tract (LVOT) obstruction, then the disease is referred to as Hypertrophic Obstructive Cardiomyopathy (HOCM). If severe, this disorder may be surgically corrected by removing excess septal tissue (septal myectomy). In other cases, medications such as beta-blockers or verapamil may be prescribed to slow the heart rate and reduce the amount of contraction in the heart muscle tissue. A pacemaker may be implanted in some cases of HOCM, especially elderly patients with significant intolerance for exercise. 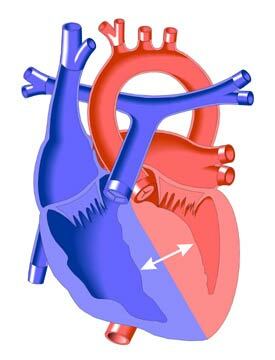 Hypertrophic Cardiomyopathy patients with no left ventricular outflow tract (LVOT) obstruction may have diastolic dysfunction (abnormalities in the interval between heart contractions, when the chambers fill with blood). This is also treated with medications such as beta-blockers or verapamil, which slow the heart rate and allow more time for diastolic filling of the ventricles. It is important to identify those patients who are at risk of sudden death. A history of cardiac arrest, a family history of sudden death from HCM, arrhythmia, recurrent fainting spells (syncope), abnormal vascular function during exercise - all are reasons for caution. Treatments to ward off sudden death involve medication with amiodarone and the implantation of ICDs (implantable cardioverter defibrillators, which will shock the heart to restore normal rhythm if necessary), both of which protect against fatal arrhythmias.